Please note: Brave Interactive Comic is better suited for independent readers or used as a read-together app. There is no voice over option in this app. I will admit that my comic reading experiences are limited — Archie Comics when I was a kid are pretty much it. That being said, I enjoyed the iPad comic experience of Brave. The story is detailed and in-depth at 48 pages. Each panel features detailed graphics, background music or sound effects, all which engage the reader. Additionally, the panels appear one at a time, allowing readers to be more engrossed in the story versus skipping to the last panel on the page. However, this can be frustrating to those of us who like to “skim ahead” before reading in depth. At any point during reading, you can swipe up from the bottom of the screen to access the settings menu. Both music and sound can be turned on or off. An autoplay feature progresses the panels on each page at a set pace. Users can also skip to any page in the comic from the setting menu. The app is limited in its interactive features, but what is included is both interesting and engaging. At certain points in the comic an icon appears that users can tap to see sketches and concept art of the main characters from the artists. On the main screen, users can access a How to Draw feature which shows in simple, step-by-step parts, how to draw one of four characters from the movie – Merida, Elinor, the Triplets (as bears), or Mor’du. At $1.99 Brave Interactive Comic is worth checking out. There are no IAP’s or social media links in this app. In the credits section, accessed from the main screen, users will find a link to the App Store to download additional Disney Digital Books and a place to enter an email address to receive updates from Disney Books. Brave Comic is an excellent option for independent readers who simply want to enjoy a good story. 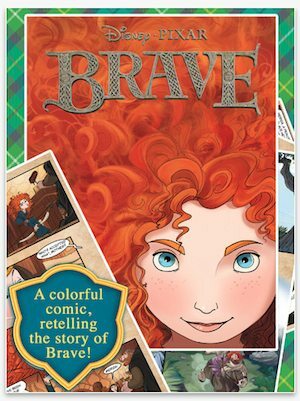 ***Relive the powerful adventure of Merida, the heroine of Disney•Pixar’s latest film “BRAVE,” in a new interactive comic! ***Explore each comic page, panel after panel, discovering artwork and special effects that bring every character to life! ***Learn how to draw your favorite characters from the movie with a step-by-step special instruction section! The Scottish Highlands have long been a fierce, proud land filled with stories, magic, and danger. “Brave” adds to the great lore of this land by telling the tale of Merida, the headstrong daughter of King Fergus and Queen Elinor. When Merida defies an age-old custom, choosing instead to forge her own destiny the ensuing peril forces her to harness all of her skills to undo a beastly curse before it’s too late, and discover the meaning of true bravery. • Full retelling of the movie in 48 interactive comic pages! • Two reading modes: panel by panel and autoplay! • Music and special sound effects in each panel! • Special sections on the main characters, with a slideshow including sketches and concept art from Pixar artists! • How-to-Draw Guide, with a step-by-step art course on Merida, Elinor, Mor’du and the Triplets!